The Mindfulness Clinic is committed to the promotion of wellbeing through the integration of Cognitive Behaviour Therapy and the practice of Mindfulness. We teach eight-week Mindfulness courses and one-day workshops to individuals, mental health professionals, voluntary and corporate groups. The Mindfulness Foundation will launch in September, 2015 with a professional two-year Diploma in Mindfulness-Based Approaches. 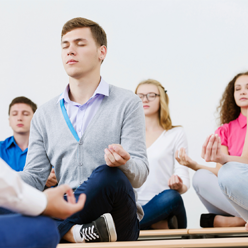 A project of the Mindfulness Clinic, the Foundation is committed to integrating Mindfulness-Based Approaches in mental health, education and community. Are you feeling stressed, anxious, overwhelmed or experience emotional distress or chronic pain? We can teach you skills to reduce stress, anxiety and low mood. Increase vitality, physical and psychological health by learning and practicing Mindfulness. Our clinic specialises in the treatment of anxiety, panic and low mood. We help people to train their minds to be open, flexible, focused and attentive to the present. Live life with greater awareness, compassion, balance and purpose. Combining meditation, breathing, attention training, present moment awareness, compassion and cognitive behaviour therapy (CBT) skills. Learn how these skills improve mental and physical health and improve mood and quality of life. Check our eight-week and one-day courses, learn how Mindfulness, MBSR stress reduction, MBCT, and CBT can help change your life. Our eight-week courses include individual consultation, counselling, coaching, CBT, and retreats. Connect with our mindfulness resources: podcasts, videos and apps, online resources, reading and professional training. Learn about neuroscience, current research and how MBCT could offer an alternative to antidepressants for preventing depressive relapse.